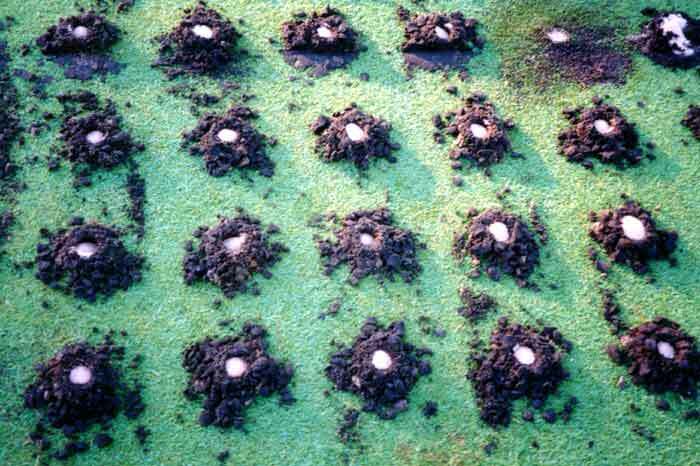 Keeping turf in top condition over the long term requires timely and appropriate maintenance. What separates good Turf Drills from Great Turf Drills? Details. Designed and manufactured for strength, durability and long life, the B & A Turf Bits flatly out performs other turf bits. We mill Turf Drills from a single piece of specially formulated high strength alloy steel, with optional heat treating for extra toughness, and tipped with a sharpened spade shaped carbide tip. When used, this configuration produces consistent multiple clear holes dramatically reducing your cost per hole. Whether your job is a soccer field, golf course, football field, parade grounds, or any turf that is in need of aerification the B &A Turf Drill Bits with multiple fluting styles and specialty tip configurations can be customized to match the needs of your job! new root development except for heavy clay soils. Soil Water typically is found either as free liquid in the voids between soil particles or as thin films surrounding soil minerals. Organic matter is a rather diverse grouping that includes all materials that are primarily composed of carbon, hydrogen and oxygen, "living, dead, or partially decayed plant and animal substances". Bulk density is defined as the dry weight of material per unit of volume. A low bulk density indicates an abundance of voids or pore spaces while a high bulk density indicates an increased amount of minerals and a reduced amount of pore spaces.